Congratulations to Our Exceptional Staff! 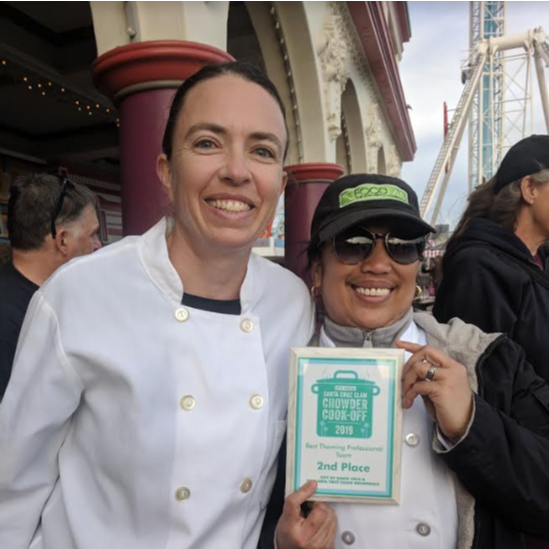 FoodLab: In February of 2019, Emelia Miguel and Violy Law led a team of students to win second place in the Professional Theme category of the Boardwalk's annual Clam Chowder Cookoff. In 2018 they also won second place in the same category, and in 2017 they won first place for the most original professional team. ​Superintendent/Principal: In 2019, Eric Gross was honored by the Association of California School Administrators as the Superintendent/Principal of the year for a three-county area. Resource: In May of 2017, Lori Postie was named “Exceptional Special Educator” by the Community Advisory Committee (CAC) of the Special Education Local Plan Area (SELPA). If those terms don’t mean anything to you, it is like she is special education teacher of the year for the county. Preschool: Pacific Preschool Teacher Stacey Reynolds received the Early Educator of the Year Award at the Central Coast Early Care and Education Conference in October of 2016.